As many of you know I visit Toy Fairs around the world and blog about my finds. 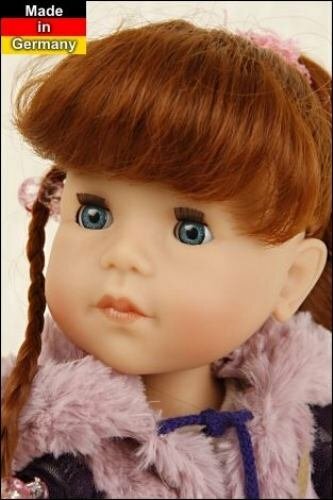 Part of the reason for doing this is to find new and exciting things to bring in to the My Doll Best Friend shop and part of it is the travel bug combined with a love of beautiful dolls. Last year I went to Nuremberg which is considered by toy manufacturers not just as a German toy fair, but actually the international toy fair for them to exhibit at. The Spielwarenmesse doesn’t target the domestic market; it’s just hosted there. More than any other toy fair in the western world, it is the one that international exhibitors and visitors in the toy trade view as the event to build their brand or to visit to buy for their business. When I was there I found some fabulous brands that I’d heard of but never had the good fortune to actually see and touch. One booth in particular looked really quite different to the rest but I recognised the distinctive very old hard plastic dolls with sculpted plastic hair reminiscent of antique dolls. However, there were also some modern play dolls with sweet traditional clothes and closing eyes which drew me in and some taller exquisite collectible dolls. The company Schildkrot/ Schildkroet, a German doll manufacturer, not just any doll manufacturer, the oldest doll manufacturer operating from 1896 to the present day was this booth’s occupant. Some of you may not have heard of their dolls but still find the name Schildkrot vaguely familiar and not know in what capacity you’ve come across it before. The answer lies in the history of Schildkrot. Schildkrot started out as the Rhenish Gummi und Celluloidfabrik Company in Mannheim-Neckarau, East Germany founded in 1873 making hair combs and decorative objects which they exported to Russia, France and Spain. This hard rubber wares factory was developing a material that could compete with hard rubber, called celluloid which was an attractive but highly unstable substance due to its flamability. Another company in Berlin had also been experimenting with this new material, and due to its compositional similarity to dynamite, an experiment with celluloid went wrong and the Berlin factory blew up. The scientist went to Neckarau seeking work and he was given the task of creating a doll from celluloid in 1895 by the Rhenish Gummi und Celluloidfabrik Company owner Frederich Bensinger. In 1896 he had successfully developed a method of blowing steam into tubes of celluloid that were placed in a doll shaped metal mould to create the first celluloid doll head. 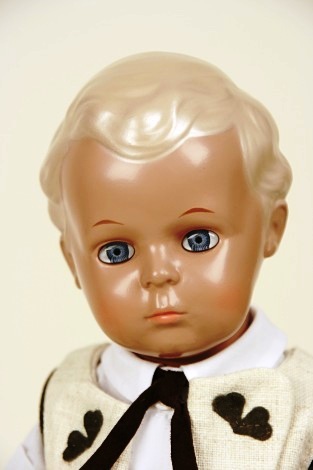 The use of celluloid in doll making was a revolution, as celluloid was unbreakable, washable, colourfast and hygienic. 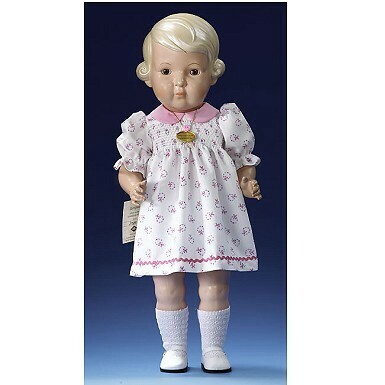 Compare this to the expensive and very fragile porcelain dolls or not very durable dolls made of papier mache,or even the clumsy wooden dolls or not very hygienic rag dolls and you can see why celluloid dolls were so popular. They were promoted as the first real child dolls for play. In 1899 the Rhenish firm registered their now famous turtle trademark and named their doll making division Schildkrot — the German word for turtle. This was followed by the registration of the trademark, the “turtle” in the Imperial Patent Office in Berlin. Their logo and trademark is the turtle which resembles the shading and pattern of celluloid products. In this photo you can see the turtle trademark still used on the neck of a doll. Such was the popularity of the dolls that the factory went into full scale production and at the turn of the century employed thousands of workers. However, this wasn’t the only product made through the technique of the pioneering blowing-pressing method used for manufacturing dolls heads. 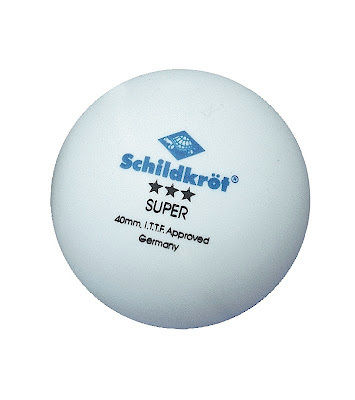 In fact using this same technique Schildkrot made table tennis balls from celluloid and this is still used as the established production method worldwide today. The turtle trademark is the international symbol used on their table tennis products and this is how you may have come across it in the past. The Schildkrot turtle is a symbol for high quality and performance in every aspect just like Steiff’s trademark ‘Button in Ear’. Schildkrot continued to grow their range of hair combs, they added jewellery to their range and small containers and continued production throughout World War I. Even through World War II, though 30% of the factory was destroyed they continued production. During the aftermath of World War II the company was bought by an American firm and they then also made cups, beakers, raincoats and rubber shoe soles for the troops in the US occupied zone in Germany. In 1967 Schildkrot developed an inflammable material, tortulon, which could do justice to all the good qualities of celluloid and this is what is still used to make the dolls today. In 1970 the company formally changed its name to Schildkrot, and exhibited at the Nuremburg Toy Exhibition for the first time in 1972. In 1982 Schildkrot was sold back to a German toy specialist couple, and they continued to produce toddlers toys, dolls and table tennis balls. In 1989, with the fall of ‘The Wall’ the company moved location and since 1993 is based in Rauenstein in Sonneberg. 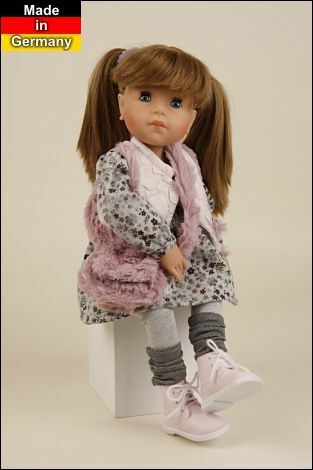 Today, Schildkrot reproduces limited edition replicas of earlier dolls which are known as second editions. They are still made of Tortulon, a high quality plastic similar to the early plastic but not flammable as was the case with celluloid. 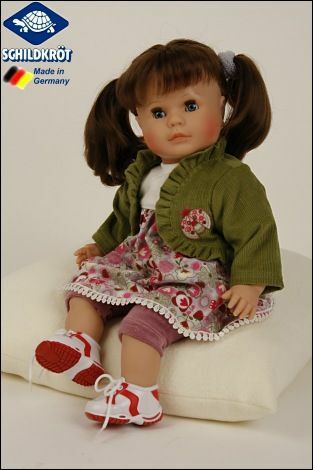 The most popular models are Hans, Bärbel, Inge, Erika, Christel as standing dolls and Strampelchen than baby dolls. Schildkrot also has a line of vinyl artist dolls, made with the highest quality human hair wigs, hand-blown glass eyes and high quality fabrics and designs. This is Alina and she is a limited edition of 999 and retails at 411 Euro incl VAT. A further range is the high quality vinyl dolls produced for children’s play. The Schildkrot motto is “We bring quality to the game” The company’s play range is built around play value and timeless design. The doll production is in Rauenstein and the vinyl production from raw materials is also in Germany. The materials do not contain phthalates, nonylphenol and PAH’s (polycyclic aromatic hydrocarbons). 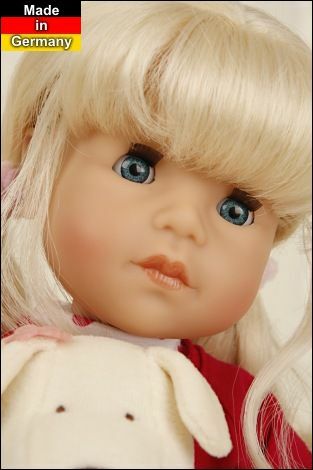 This vinyl baby doll is 32cm, fully aritculated, durable and soft filled. She has sleep eyes, sculpted hair and the name and date of birth can be embroidered onto her tummy if you want her personalised. She is a limited edition. 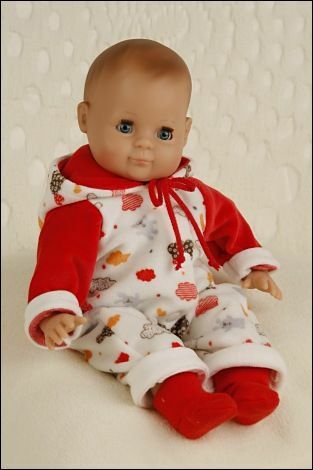 One of the really lovely features about the soft bodied dolls they make is that you can have the name and date of birth embroidered on the cloth tummy of any doll on request. 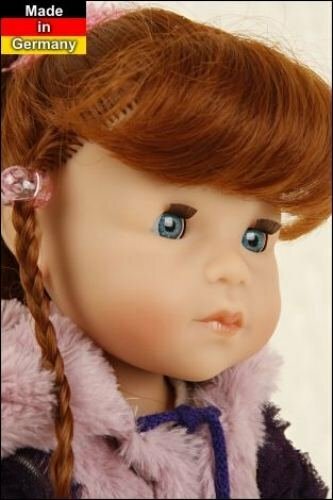 This is gorgeous vinyl doll Hanni who is 45cm and cuddly, with her velvety body filled with soft pellets, she’s a pleasure to cuddle and care for and has soft rooted hair. 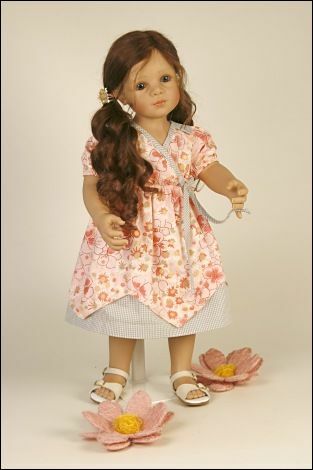 There are many play dolls from baby dolls through to tall standing dolls. However, there’s one line, a limited edition of three vinyl dolls that are of particular interest as it fits the genre of doll at My Doll Best Friend. The first is photographed at the start of this article. This collection was produced in 2012. They are 43cm in height, so 17″, made of phthalate free vinyl, have sleep eyes with joints in the elbows and knees too, and washable synthetic rooted hair. They retail at approximately 100 Euro. If you are interested in visiting Schildkrot you would be very welcome as they have a museum for visitors at Rauenstein in Sonneberg. It was an exciting discovery at the Nuremberg Toy Fair and I’d be very interested to hear which of the dolls have captured your imagination. Please do comment below! What do you think of these play dolls?